If You Want to Write - Learn How to Do It. Novel, Short Story, Fiction or Nonfiction Doesn't Matter. Everybody Writes And So Can You! If I tell you to pick up a page and a pen and start writing about the first thing that comes to your mind, what would it be? Do you have a book idea that you’ve wanted to write for a while but were confused on where to start? With How to write your first book you will know how to come up with ideas, how to write first drafts, how to grab reader’s attention. It may look hard for beginners but you can do it. You just have to learn how. 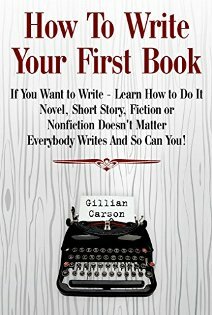 How to write your first book will guide you helping to figure your purpose of writing. It’s in you and all you need to do is start from the right side! It doesn’t matter if you are looking to write novel, short story, fiction or nonfiction book, whether you choose to publish it on your own or send it to the publisher, this book will be your value, your impulse of creativity! Everybody Writes And So Can You!